Page 194 of the California 1852 census, that shows the 18 Chinese workers on the farm of Strobridge and Pitcher has been made available, courtesy of G.J. "Chris" Graves and Carol Graves. 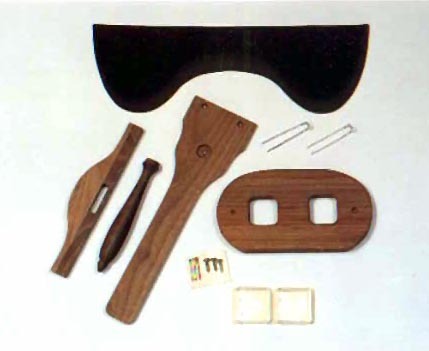 The Lucas-Price heirloom quality, Holmes-style Stereoscope Kit now available wholesale!! A great, quality, gift idea that can retail under $40.00 USD. Wholesale pricing begins at $22.50 USD per unit (shipping included) to most U.S. destinations. Further quantity discounts are available. Minimum order is six units, all orders pre-paid. Please contact me for more information, further pricing, or payment information. 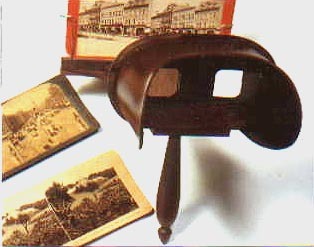 A Holmes style viewer was the inspiration for this beautiful hardwood stereoscope kit. Although competitive makers claim "innovation" with a wider hood and viewing area, we at "Lucas-Price" have been building stereoscopes, and stereoscope kits, with this feature (widening of the hood to provide a comfortable fit for people wearing eyeglasses) since 1996. Other design changes, and true innovations attributed to the "Lucas-Price" scope include; - the "Dummy Dot". A plug at the end of the focus rail which keeps the focus bar from sliding off the end and becoming separated and lost; - the "Stay Put Focus". This feature keeps the focus where you set it for easy viewing in any position; - the "leatherette hood" provides a soft area to rest on your forehead unlike uncomfortable, and sharp, wood or tin hoods; - the "lack of a septum" which (in most cases) is a non-functional obstruction that just gets in the way, or breaks off. This kit is designed for young and old alike. By using furniture quality, properly cured, hardwood (Walnut), and scratch resistant polycarbonate lenses(use compressed air or a soft 100% cotton cloth for cleaning), it presents well, and should last long enough to become a family heirloom. Almost indestructible, it's safe for youngsters to use, unlike scopes with hoods made of tin (that could develop a sharp edge), or thin wood (that can crack and splinter). All parts are secured with brass screws and tacks for a solid assembly. - Parts and instructions for building the kit. - Some history on the stereoscope. - Instructions for taking your own 3D photos with a 35mm or digital camera. - Some sample views for immediate gratification!
" I bought one of your kits last month and just put it together this weekend. I wanted to let you know how pleased I am with it. Assembly was a no-brainer and the finished product looks great and works perfectly." 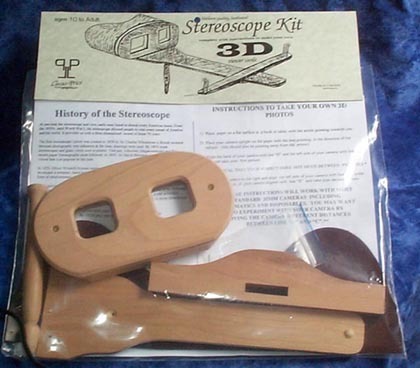 " I am very happy to have 2 of your stereoscope replica kits. They are used in an exhibit at the New Jersey Historical Society in which some of the "hands-on" portions will include historical "stereoviews" of New Jersey. Your kits are perfect for the exhibit as many people will be handling the stereoscopes." • All prices are quoted in USD..
• Canadian and International orders, please write or call for shipping options and fees. • Walnut, Cherry, and Oak hardwoods are used in manufacturing. If you have a preference, please check for availability when ordering. • Please give a 3-4 week lead for time-sensitive orders. I'm exploring an area that is pretty new to me–the origin of the SP cab forwards. The conventional wisdom is that they were inspired by William Thomas's narrow gauge cab forward on the NPC. Do any of you know the source of the connection between Thomas and the SP Back-ups? I'd like to know who–and where–this connection was first made (I'll settle for "first made" in print). I paste in below an article from the Reno Gazette-Journal of 2004. It conveys a lot of information about the event, and even names a name: Charles Browning. Do any of you know any more about this fellow? This article sounds like it was drawn from a published and detailed source. My recent interest in this issue comes from the realization that the CP had been operating a small fleet of "cab forwards" since the early 1870s down at Oakland–and were still operating them when the first mallets were smoking their way over the Sierra. I refer to the 2-6-2Ts, which were apparently operated cab forward as often as not. On one hand, these locomotives may–in some unrecognized way–have inspired William Thomas. Since they were right across the bay from him, he would certainly have been aware of them, and likely knew first-hand engineers who operated them. He may heven have ridden in their cabs, for all we know. Moreover, and perhaps more significantly, their long and successful use created a body of senior locomotive engineers well-conditioned to running "backwards" at speed. This collective experience may well have had something to do with the engineers' willingness to try something novel. The No. 4000 and No. 4001 were the first of the mallets purchased by the Southern Pacific Railroad. They were built in the normal configuration with the cab-to-the-rear. Mallets are railroad engines having more than the usual number of wheels and axles. Because of this, the train�s weight was distributed over more axles. And because of its design, mallets were very well suited to travel in mountains where there are short curves. When placed in service on �the hill� (aka Donner Pass), mallets out performed all the existing power by a wide margin. But it became immediately evident that there were some serious problems. The amount of exhaust gasses that left the stack was so much greater in volume and so heavily concentrated that the engine men experienced smoke asphyxiation and called for an immediate solution. The railroad responded by issuing respirators to the engine crew, but the long snow sheds only exacerbated the smoke inhalation problem. Engine crews began refusing to take the engines over the hill. C. Browning Jr., the Engineer of Tests at the Sacramento shops, decided to see and experience firsthand what the problem was by riding in the cab of No. 4000. It took him awhile to recover from his ordeal, and at that time, he met with Mr. Heintzelman, the superintendent of motive power, along with Frank Russell and several other officials. Together, they held a conversation that ultimately changed the way the railroad handled moving trains through the mountains. Heintzelman said the problem of the smoke in the cab must be solved because those engines were bought to run on �the hill,� and they will run on �the hill.� Any idea no matter how far fetched would be considered. Many suggestions on attacking the problem were made. It was Charles Browning who stepped forward. He recalled another type of engine that might be the solution. He recited the advantages of the Thomas engine with respect to a Sierra Grade. That area had many snow sheds in critical locations. Browning pointed out that if the cab was in front, the fumes and stack gasses would be behind since the smoke box and stack gasses would be a minimum of 70 feet to the rear of the cab. The suggestion solved two problems. By placing the cab forward, the smoke box at the tender end solved the employees� respiratory problems, and the engineer and brakemen now would be able to have clear visibility. Bruce Cooper located a dissertation about 19th century Chinese-American music that has been republished as a book: "Yellowface: Creating The Chinese In American Popular Music And Performance, 1850s-1920s" by Dr. KRYSTYN R. MOON who is now at Georgia State University. I haven't the least idea, but what a fascinating question. Since I am presuming that all such music was person-to-person and may well have been regional and traditional in nature, where would a researcher start? Back in China, to learn what was popularly sung and played on smaller portable instruments in the provinces at the same interval and for decades or a century before? I would sincerely appreciate any leads you could give me for discovering sources of Chinese-American music of the 19th century of any kind, especially related to the Central Pacific railway construction period. I am very interested in doing musical research in this area, and am an old friend/colleague of the California pianist, Jon Jang, who you may know, and I am hoping he may be able to steer me to something as well. Hoping to hear news from you, xiexie.